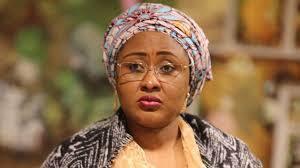 WIFE of the president, Aisha Buhari, has returned to London to be with her ailing husband, President Muhammadu Buhari, having only last week appeared in the country. For a while now, she has been with her husband in the United Kingdom but came into the country at the week to attend a women’s event in Owerri, Imo state. It was not clear whether her presence in the country at the weekend was solely to participate in the event. Presidency sources revealed on Monday that she has now flown bank to London where she is expected to remain till her husband is well enough to return to Nigeria. The President has been in the U.K. since May 7, 2017 on a medical vacation for an unknown ailment.